It was time for a meal with my cousin, who is always willing to hit a new spot. She had been to 1847 before and recommended we go. Off to Brooklin, I drove by it 3 times. *facepalm* Their Twitter feed said that the week after my visit, they had a new awning installed making it more visible. Glad to hear it! It used to be the home of a bank, complete with a vault, now set up as a party room. The décor has an expensive pub feel. All of the furniture is dark wood accompanied by high ceilings and large windows that let in lots of natural light. The atmosphere is cozy and comfortable. They also have a patio. The tables were a little close together if you were sitting at a table for 2. The bar is stocked with a great variety of beer and wines, including brews from the local brewers, 5 Paddles. 1847 is known for sourcing locally. I'm not just talking about food! Local musicians frequently play here. Anything from blues to rock can be heard. The menu changes as the seasons change. 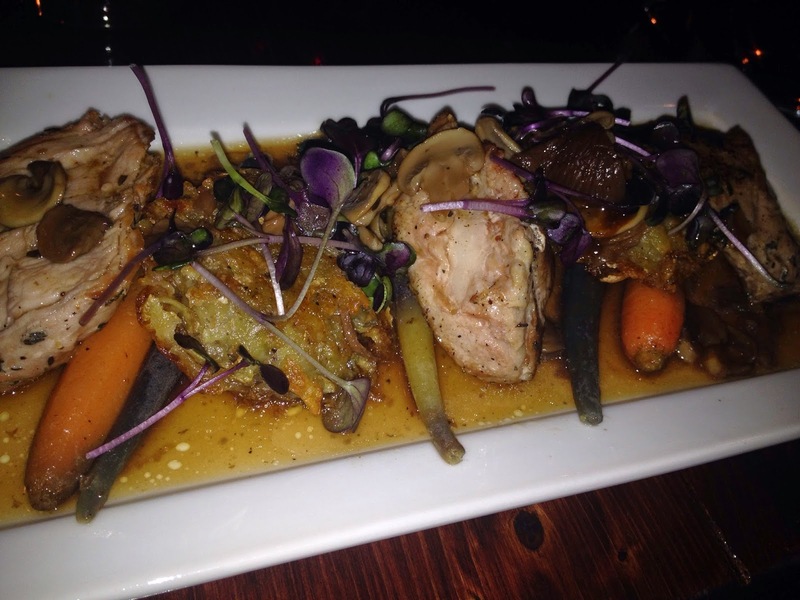 They source locally and seasonally to ensure the freshest ingredients. This is not your common pub! Feeling the need for apps, she chose the Local Green Salad and I picked the Goat Cheese. 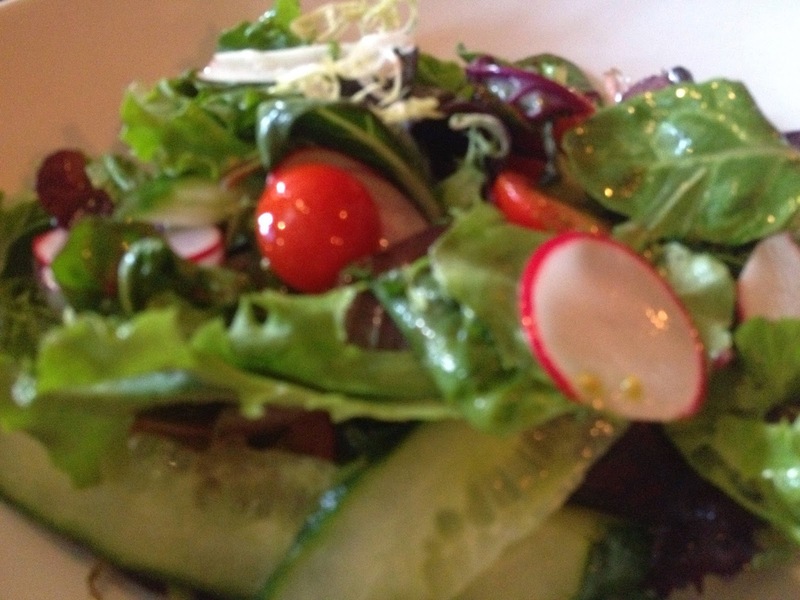 The salad was fresh and crisp topped with radish, cucumber and cherry tomatoes and smothered in a sherry vinaigrette. Meant to be a starter salad, it was a decent size! The pistachio goat cheese was warm and rich. Whenever I've had goat cheese, it's always come with some sort of bread; I expected it, even though the description didn't say it. 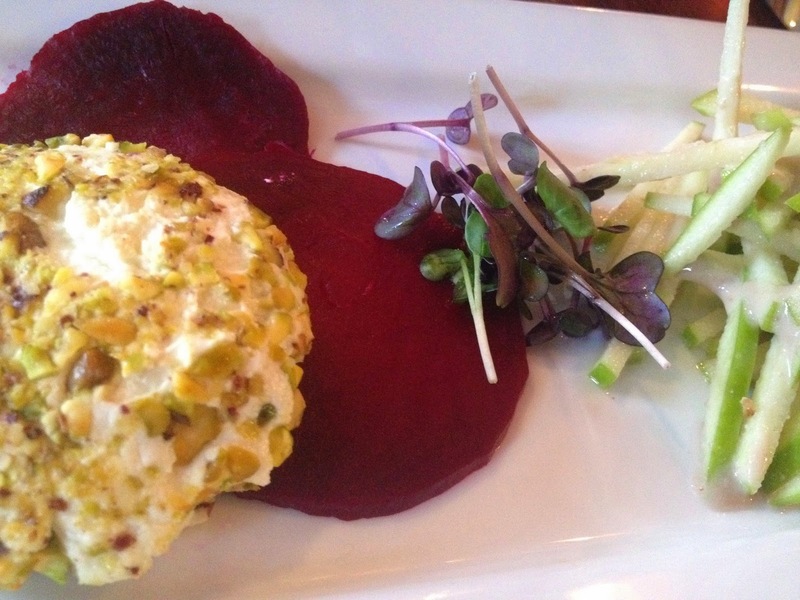 This dish made me rethink appetizers, goat cheese doesn't NEED bread. The local beets with walnut apple slaw was delicious. I never thought of putting all of those foods on one plate! A pleasant surprise! 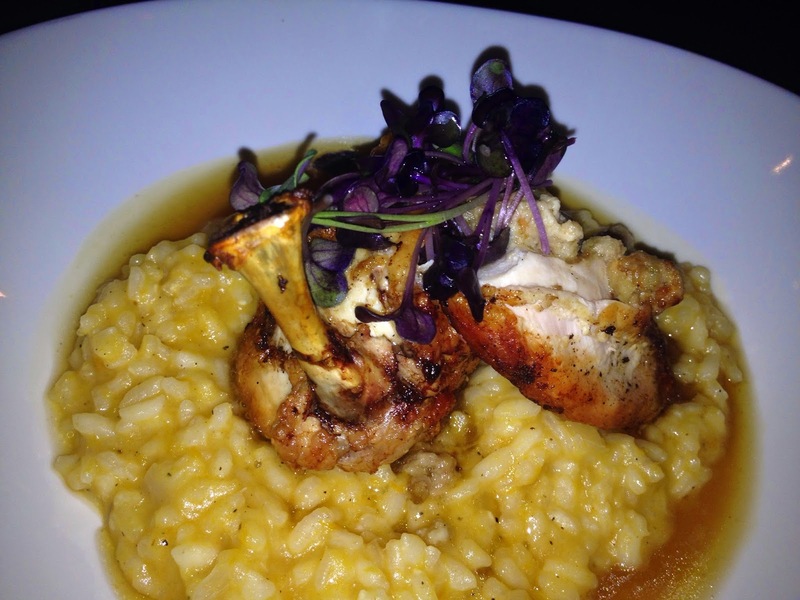 As for the main dishes, she had the Roasted Chicken with Butternut Squash Risotto and I had the Pork Tenderloin. The roasted chicken was so tender and juicy, it almost fell off the bone. It was atop a pile of creamy butternut squash risotto. It's official, butternut squash is amazing in everything! My pork medallions were savoury and perfectly cooked. The potato pancakes that came with it, weren't like I'm used to. They were breaded. I'm not sure if that's normal, but the jus from the pork made the breading soggy. I was sad. I love potato pancakes! The roasted vegetables smothered in the jus disappeared rather quickly. Yummy. The table next to us had an issue with one of their meals and the server took care of it in a very professional manner. He made sure that it was corrected and that they were pleased. It's nice to see how restaurants handle kitchen or service issues and they did well. Except one thing. Since our server was busy handling the next table's issue, he just brought us the bill without offering us anything else. We wanted dessert! We even snagged some dessert menus! Oh well, will save room for the next visit! It's a delightful place with great staff and chefs. Check it out! Farm to Table ALL THE WAY!